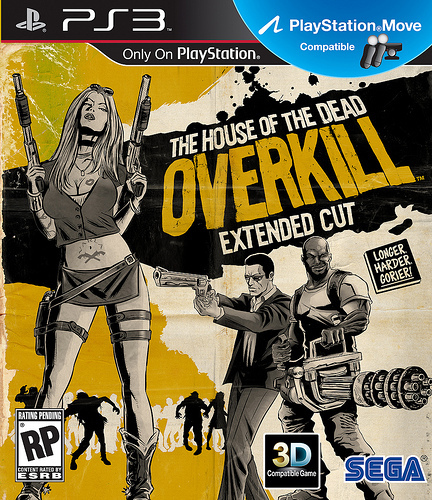 House of the Dead: Overkill is a rail shooter which was exclusive to the Wii along with a whole lot of other rail shooters but when Dead Space 2 Limited Edition was bundled with the full version of Dead Space: Extraction which was yet another Wii exclusive rail shooter it was a great treat for the PS3 users to get a taste of something great. But now House of the Dead is making a debut on the PS3 and as one of the most abusive rail shooters I have ever played I can definitely say this is going to be great. House of the Dead: Overkill is a huge overhaul from the earlier games, taking a turn to the mature side of gaming House of the Dead: Overkill offers lots of language, blood and dismemberment. Now coming to the PS3 with native move support you can rest assured that the game will give you an equal if not better experience on the PS3, with the help of HDMI players can experience graphics in 720p of beauty and with some bonus PS3 features the game can be even more fun. Although the game CAN Be played with DualShock 3 (Dead Space: Extraction was playable with it) it would still be the best experience to enjoy the game using the move with the sharpshooter or the pistol accessory. The game is releasing October 25th 2011 which is almost the release date of Battlefield 3, so I won’t be surprised if Battlefield 3 shadows over this things release. Gran Turismo 5 comes with Optional 10GB HDD Installation feature, Will make it run better. Children of Eden will come in Early 2011.